WASHINGTON, DC, December 19, 2016 (ENS) – The American Bird Conservancy and its Brazilian partner Aquasis have secured more than 170 acres of critical habitat to improve the chance for survival of one of the world’s rarest and most spectacular birds, the Araripe Manakin. eastern Brazil and connects it to the larger Araripe National Forest, protecting what might become new breeding territories for the unique red-and-white bird and other rare species. 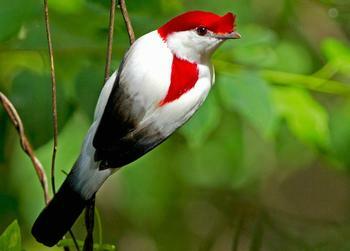 Discovered just 20 years ago, the Araripe Manakin has dwindled to a population of fewer than a thousand birds. They depend on a unique type of forest found only at the base of the Araripe Plateau in Brazil, where encroaching human development – farming, cattle grazing, and home construction – has pushed the species to the brink of extinction. In 2014, the American Bird Conservancy, ABC, helped Aquasis purchase 140 acres in a prime breeding area for the Araripe Manakin. This year, ABC and Aquasis had the opportunity to acquire an adjacent property that includes springs, streams, and forests, all the elements required to support as many as eight new breeding territories for Araripe Manakin. The purchase was made possible by the support of the IUCN National Committee of The Netherlands, Gulf Coast Bird Observatory, Quick Response Biodiversity Fund, David Davidson, Larry Thompson, Silicon Valley Community Foundation, and a number of other donors to ABC’s online campaign. The Araripe Plateau lies at the heart of the vast, semi-arid, drought-stricken caatinga biome that dominates most of the landscape of northeastern Brazil. The demand for water it is increasing as the region develops into an urban landscape. The Oasis Reserve provides a life-giving source of water for the surrounding communities living in the caatinga shrublands. 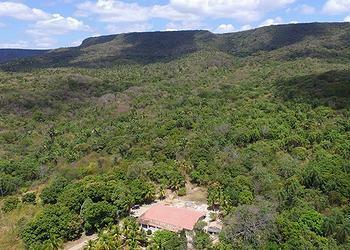 The reserve is an essential refuge for other birds that depend on this habitat, such as the Silvery-cheeked Antshrike, the White-browed Antpitta, and the Caatinga Antshrike. Another endemic species in the area, the Yellow-faced Siskin, will also benefit from the reserve expansion. This northeastern Brazilian bird, a favorite target of the pet trade, uses many kinds of habitat, including lowlands, mountains, forests, and open areas. The Yellow-faced Siskin was quite common until the 1980s but it has declined in recent decades. Expanding the reserve not only protects essential territory for the birds, it enables conservation actions that will boost their numbers. Managing water resources will be essential to that effort, because streams have been an important limiting factor in the recuperation of the Araripe Manakin,” explained Hennessy. The reserve extension will allow Aquasis to better manage two vitally important springs in the area for the benefit of birds as well as people. The southern spring will be managed to create two streams, which Aquasis will reforest with vegetation that offers ideal breeding habitat for the Araripe Manakin. Aquasis will now be able to use the northernmost spring to create a stream route that traverses more of the forest area and offers more breeding territory for the birds. With good stream management and revegetation, Aquasis predicts it will be able to provide habitat for 12 new nests in the northern part of the reserve, where the newly acquired land is located, and eight in the southern section, supporting breeding areas for as many as 20 pairs of Araripe Manakins.